Because We Follow Christ, That’s Why. by doublespringschurch.In Grow.Leave a Comment on Because We Follow Christ, That’s Why. For those who don’t already know, we’re in the interview process of calling a new Youth Pastor to lead our Middle & High Schoolers at Double Springs. While we wait I have the honor of leading the youth ministry. To be honest, it took me a few days to shake the cobwebs off but man alive, I’m having a ball with it now! Last night at #WNL (Wednesday Night Live…this is what we’ve rebranded our MidWeek Student Ministry), our students met and conquered a challenge that I’d given them earlier in the week. I’d asked them to fill 41 chairs at WNL. That’s a BIG number for a Youth Ministry in an extremely rural area, folks. Yesterday morning, I sat out 41 chairs for our WNL service and prayed over each one. When 6:30 rolled around I noticed that we had LOTS of 1st time guest and guess what? Some of our regulars couldn’t make it AND WE STILL had to go get more chairs. Let me take a minute to say AMENHALLELUJAHPRAISETHELORD! You see, though I’ve been out of the game for 7 years and while A LOT has changed about Student Ministry in that time, much has also stayed the same. For instance, Middle and High Schoolers still have friends who need Jesus and it’s their privilege/duty/responsibility/calling to introduce them to Him. They have a unique and unrivaled opportunity to reach the peers that God has sovereignly placed in their lives. They can influence their friends in ways that I can’t through the already formed divine relationships they share. I’m super proud of our Youth who leveraged Social Media, lunch table conversations, texting, snap chat (I don’t even know what that is) bus rides, etc. to get the job done and meet the challenge (By the way, we’re not content with this. NEXT WEEK IT’S 50! Help us pray that happens!). I say all that to say all this – You and I have NO EXCUSE for not inviting the people who God has allowed us to cross paths with to church. None. Zero. Zilch. Nada. I mean, seriously, how easy is that? You have a friend…your friend needs Jesus…you are going to a church this Sunday where Jesus will be shared, worshipped and actually in attendance…how could we NOT invite them? Listen, inviting someone to church has never been simpler. We have phones, social media, literally thousands of tools at our disposal not to mention plain old (God ordained) conversations we’ll have throughout the week . There really is no excuse! I’m challenging you, folks. Learn and be inspired by our youth! This week EVERY WEEK: Invite, at MINIMUM, one person to join you for Worship this Sunday morning. Maybe inviting them to Small Group would be a better avenue…whatever! Just invite them. Look, I know that it’s Labor Day Weekend. I also know that Jesus doesn’t take Holidays so He’ll be there. I also know that Saturday is the opening day of Dove Season but the fact is, hunters will need to be in church Sunday to repent of all the cussing they did missing birds and the lies they told about how well they shot! Lol! Believe The Gospel – Seriously, if you believe the Gospel it’s much easier to invite people to hear it because you know the price tag attached to sin and you know that Jesus death, burial and resurrection means that debt has been “paid in full”. Lives, ETERNAL lives of those we love are at stake. Trust The Holy Spirit – God is not willing that any should perish but that all would come to repentance. His Holy Spirit is at work in the lives of those who don’t know Him. Trust that. 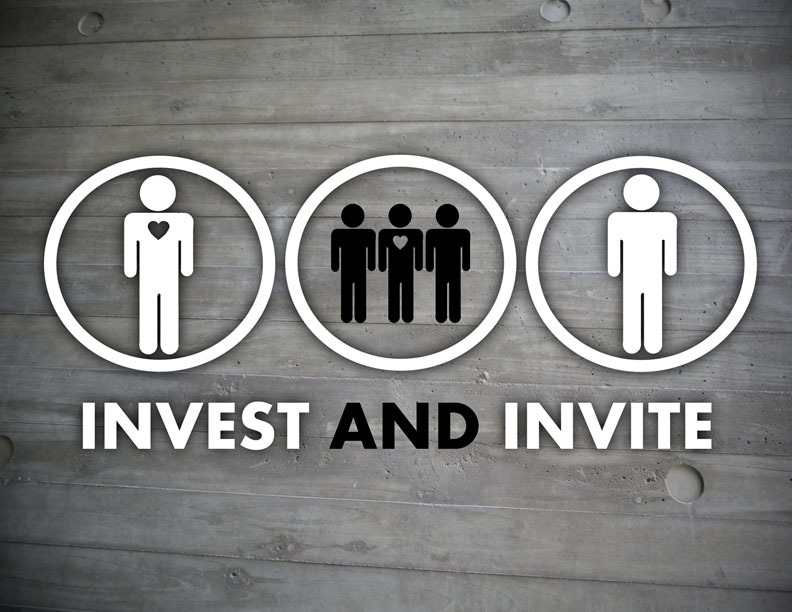 Invest In People – Work to build, strengthen and maintain relationships with those who haven’t met Jesus. Invest in daily prayer for them and keep your eyes, ears and heart open to see opportunities that God has given you to invite. Commit To Prayer – Those who know me well know that I’m a “list guy”. I have a list of people who don’t know Jesus that I committed myself to pray for daily. I encourage you to do the same. By the way, it is AWESOME to see a name crossed off that list and added to the list of new Christians that I’m praying for. REALLY Care – Research and statistics reveal to us that the vast majority of our unchurched friends would come if someone cared enough to invite them. Think about that a minute. Let’s say I had a friend that possessed the cure for a deadly disease that I had contracted. What would you say about my friend if he kept that cure to himself? Would you say that he was selfish? Cruel? Maybe even evil, right? You certainly wouldn’t say that he cared, would you? Church, the disease is real and the consequences are eternal. We know the cure. It’s time we start sharing it. I look forward to seeing you all on Sunday (with a friend). Previous Previous post: Want Your Small Group To Thrive? Get To Work.